32 ROOF COATINGS 2018 COATINGSPROMAG.COM Roof Restoration or Replacement? 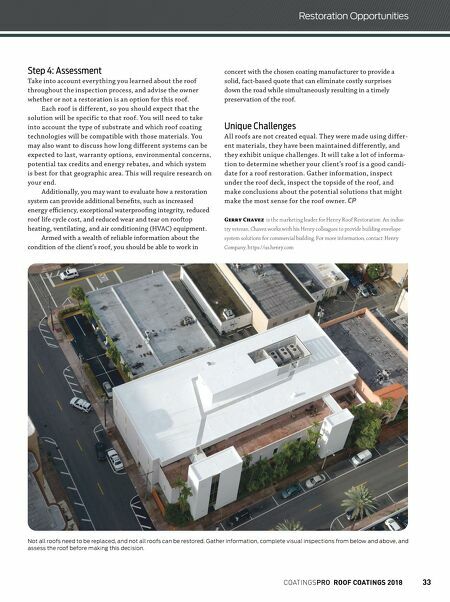 By Gerr y Chavez, Marketing Leader, Henr y Roof Restoration Photos Courtesy of Henr y Company B uilding owners and facility managers know that eventually they'll have to face the prospect of replacing their roof. is typically requires a large capital investment and results in a signifi cant disruption in the day-to-day activities of the facility. Fortunately, in many cases there is a money-saving alter- native to reroofi ng: roof restoration. Employing advanced roof-coating technologies, such as silicone, acrylic, or alumi- num, roof-restoration systems enable the facility's current roof membrane to be restored at a fraction of the cost of roof replace- ment, ultimately extending the roof membrane's life cycle. is is not a one-size-fi ts-all solution, though. ere is a window of opportunity for roof restoration that you need to be aware of before it's too late. Generally speaking, if 25 percent or less of a roof needs to be replaced, then restoration is a cost-eff ective option. But how can you know if your roof is a candidate for restoration? 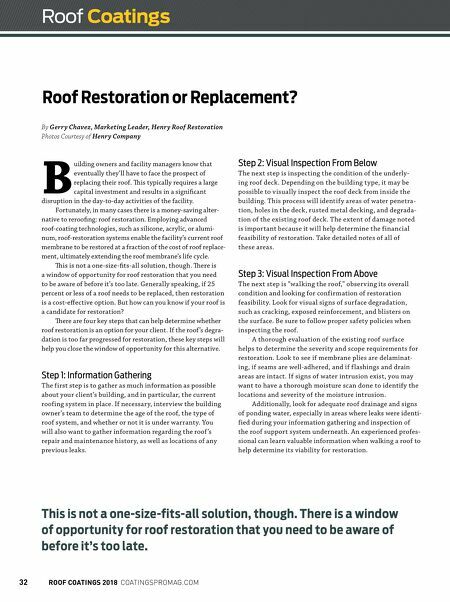 ere are four key steps that can help determine whether roof restoration is an option for your client. If the roof 's degra- dation is too far progressed for restoration, these key steps will help you close the window of opportunity for this alternative. Step 1: Information Gathering The first step is to gather as much information as possible about your client's building, and in particular, the current roofing system in place. If necessar y, inter view the building owner's team to determine the age of the roof, the ty pe of roof system, and whether or not it is under warranty. You will also want to gather information regarding the roof 's repair and maintenance histor y, as well as locations of any previous leaks. Step 2: Visual Inspection From Below T he next step is inspecting the condition of the underly- ing roof deck. Depending on the building ty pe, it may be possible to visually inspect the roof deck from inside the building. T his process w ill identif y areas of water penetra- tion, holes in the deck, rusted metal decking, and degrada- tion of the existing roof deck. T he extent of damage noted is important because it w ill help determine the financial feasibility of restoration. Take detailed notes of all of these areas. Step 3: Visual Inspection From Above T he next step is "walking the roof," obser ving its overall condition and looking for confirmation of restoration feasibility. Look for visual signs of surface degradation, such as cracking, exposed reinforcement, and blisters on the surface. Be sure to follow proper safety policies when inspecting the roof. A thorough evaluation of the existing roof surface helps to determine the severity and scope requirements for restoration. Look to see if membrane plies are delaminat- ing, if seams are well-adhered, and if f lashings and drain areas are intact. If signs of water intrusion exist, you may want to have a thorough moisture scan done to identify the locations and severity of the moisture intrusion. Additionally, look for adequate roof drainage and signs of ponding water, especially in areas where leaks were identi- fied during your information gathering and inspection of the roof support system underneath. An experienced profes- sional can learn valuable information when walking a roof to help determine its viability for restoration. Roof Coatings This is not a one-size-fits-all solution, though. There is a window of opportunity for roof restoration that you need to be aware of before it's too late.